Architect Jacques Germain Soufflot was born in Irancy, Yonne, on July 22, 1713. 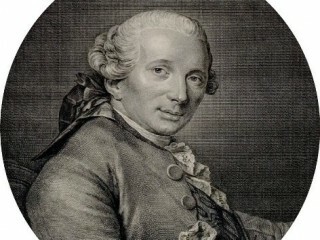 After briefly studying law in Paris, he traveled to Italy, where his interest turned irrevocably to architecture, and in 1733 he was admitted to the French Academy in Rome. He was in Lyons by 1739, where he published a book on St. Peter's. Soufflot's design for the enormous Hotel Dieu (1742) in Lyons made his name known in Paris and brought him to the attention of the influential Marquis de Marigny, brother of Madame de Pompadour and later directeur des batiments. In 1750 Soufflot accompanied Marigny to Italy, where they examined the recent excavations at Herculaneum and measured the Greek temples at Paestum; the architect's Suite de plans de trois temples i Pestum was published in 1764. Soufflot also appreciated the Gothic style, whose structural qualities he particularly admired. His paper De l'architecture Gothique, read in 1742, reveals an awareness of the Gothic structural lightness and soaring elegance, which he wished to apply to buildings cast in the classic mode. Although Soufflot built two town houses in Paris and several garden pavilions at Menars for Marigny, these architectural accomplishments pale beside his imaginative design for the church of Ste-Genevieve (now the Pantheon) in Paris; begun in 1756, it was finished in 1792, 12 years after his death in Paris on Aug. 29, 1780. The structure was the first of its kind in France to convey a true feeling of Roman classicism. The hugely scaled hexastyle Corinthian portico was inspired by the Temple at Baalbek or the Roman Pantheon. The peripheral walls are starkly simple, the only embellishment being a continuous entablature with a carved frieze of decorative festoons. The building is a Greek cross in plan; its multidomes recall the disposition of St. Mark's in Venice and St-Front at Perigueux. The interior provides a sense of monumental ordered elegance and a certain "sublime simplicity" much sought after in the subsequent neoclassic movement. A multitude of colossal but slender Corinthian columns conveys, however, something of the lightness of the Gothic idiom. Most unusual is the treatment of the vast dome, which, though inspired by St. Peter's in Rome and more particularly by St. Paul's in London by Sir Christopher Wren, rests not on the usual heavy piers but on daringly light supports. Although they were later reinforced by his pupil Jean Baptiste Rondelet, the original delicate piers must have produced a feeling of airy fantasy akin to that of the works of Giovanni Battista Piranesi. View the full website biography of Jacques-Germain Soufflot (En. ).